2, Lee, J. S. "A Switching Mode Transistorized Voltage Regulator*" Power Supply Seminar Papers by Texas Instrument Inc.
3. Bamberg P. #1GIeichspannungswandler mit Geregelter Ausgangsspannung" El ec Ironische Rt mdschau. June 1963, p. 289. Fig. 6. Full-size printed circuit layout. This view is from the copper sidey showing where the components lie on the opposite side. This is an article to present a simple counter that works well as an end of the line indicator for the Model 14 typing reperforator, It will work equally well on any other type of reperforator, providing it has a punch bail used to operate a cam which in turn is used to close two contacts of a leaf switch each time the bail moves back. The cam-switch arrangement can be ad fled to any reperforator by using one's imagination. As can Ite seen from the schematic, the circuit is very simple; The power transformer was taken from an old television booster but anything that will supply the necessary ISO volts for the high voltage and 6 volts for the filament of the 6C4 will work fine. 1 be rectifier is a 1N2071 silicon rectifier in a simple half wave circuit. The filter capacitor can be anything from 40 jjf on up. ¡ he voltage regulator was included after the authors found that, without it, I fie counter was not accurate, due to changes in the = ine voltage:. After the VR150 was added, the counter was accurate to plus or minus one pulse. The dc voltage is keyed by the cam-switch arrangement mentioned earlier. The rest of the circuit is composed of an integrator network and a dc amplifier, Each time the switch is closed by the cam, it sends a pulse of voltage through the variable resistor into the capacitor. The capacitor stores the pulses of voltage until the level is high enough to fire the NE-2 neon bulb. When the NE-2 fires, it drives the 6C4 grid positive making the tube draw a larger amount of current. 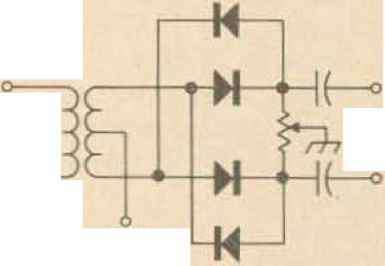 This increase in plate current pulls in (lie plate relay which is in the plate circuit of the 6('4. W hen the relay pulls in* one set of contacts rings a bell indicating a full line has been punched, while the other set of contacts shorts out the capacitor, discharging its stored voltage, and the counter starts counting at zero again. The 10 \if capacitor across the winding of the relay gives a lioid in" time of about one second. This makes the bell ring for a short period instead of just striking once. It also provides a longer time to discharge the stored voltage in the capacitor. The purpose of the reset switch is to set the counter to zero at any time. Because we are typing blind when we use the 14, we sometimes forget where we are in our train of thought. W hen we start a transmission to any station we send his call, de K8JAC or K8IQY in Midland, Michigan returning, then reset the counter and proceed. We hope this article will be helpful to those amateurs who have reperforating equipment in the shack but have not gotten it on the air because they lacked the necessary end of the lime indicator- Although the one we constructed is not accurate to the pulse, it is accurate enough so we never over print another stations machine because we have punched too Ion^ of a line. At the present time wre are using a 65 character line. As most machines will print a 72 character line before they over print, this gives a wide margin of safety with the plus or minus pulse accuracy of the counter. The number of characters to a line can be set to any number by tile individual operator. Fhis adjustment is made with the potentiometer in the integrator circuit. On our model we can varv the number of characters r to a line from 40 to SO with the 50 K potentiometer that we used. 1. A simpîe end of line indicator. Much Capacitance for the SSB Rig? Once upon a time I decided to build a big linear, (Didn't we all.) I liad the big bottles, a power transformer, choke, sockets, chassis, variable capacitors, and even a circuit diagram for the final. No sweat so far. Let's draw the diagram for the power supply, haul out the surplus catalogs for the miscellaneous components and away we go. ## !! Look at the prices on those capacitors! They cost many dollars per microfarad. The higher the working voltage, the higher the price, Maybe we don't need 80pf at 3 kv after alL Lets see what the Handbook says. The output capacitor should present a low reactance at the lowest frequency of interest." Thanks a lot, Buddy, What's low? Now comes the first of the assumptions. If the power supply is a half wave job, there is 1/60 second, or something less, between the intervals when the power supply is putting power into the capacitor. As a sort of worst possible case, assume that this capacitor must supply the entire amplifier input power for the full 1/60 second. This power is VI, where V is the power supply voltage and I is the peak dc current that the final stage draws.